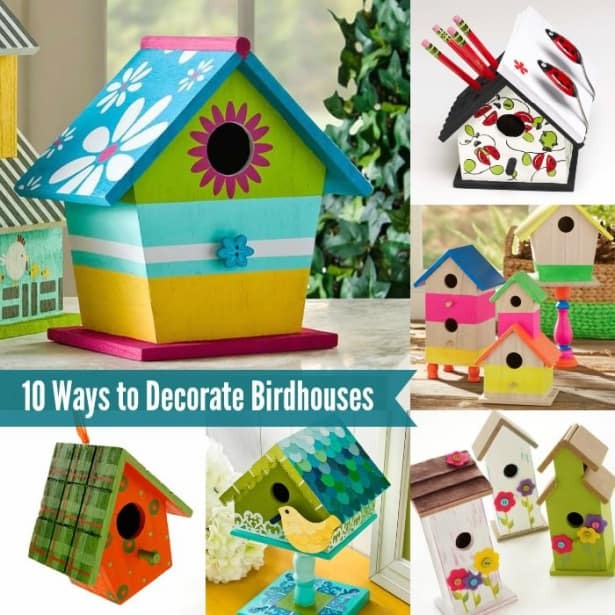 Make beautiful home decor – decorate birdhouses! Learn 10 techniques for decorating birdhouses with various items – and scroll down to get a video at the end of this post showing you how to paint a birdhouse. Skill Level: Beginner to Intermediate. Some of these techniques are easier than others, but none of them are exceptionally hard. 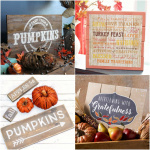 Basic crafting skills are necessary, like using a paintbrush or punches and stencils. I absolutely love decorating birdhouses! It's one of my favorite craft activities for spring and summer. I see unfinished wood birdhouses everywhere, just begging for a coat of paint or some paper decoupaged to the sides. If you want to decorate birdhouses, you've come to the right place. I've got some great ideas for you! 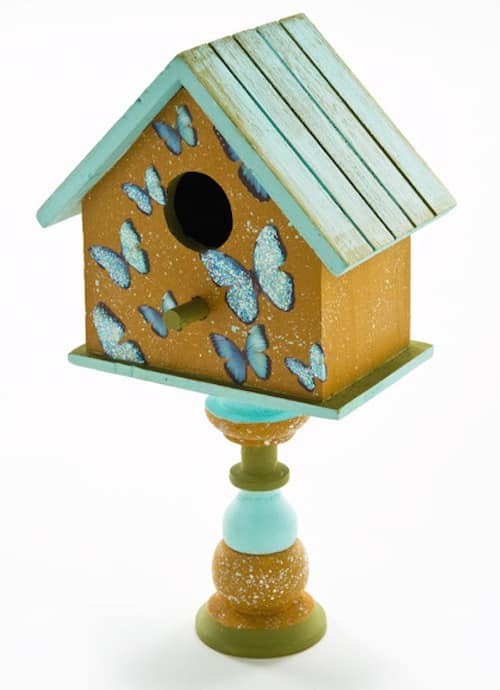 Before you begin decorating, you're going to need a birdhouse, right? Let's start there. Just about every craft store has birdhouses in the section with the other wood surfaces. They have smaller ones that hang on strings for around $1 – $2, and then larger ones that are more intricate and cost anywhere from $5 – $10. A great option for inexpensive birdhouses is the dollar store or the dollar bins/section at stores like Target. Another great option if you want to buy birdhouses in bulk is to go online. Consumer Crafts has some great sets here. 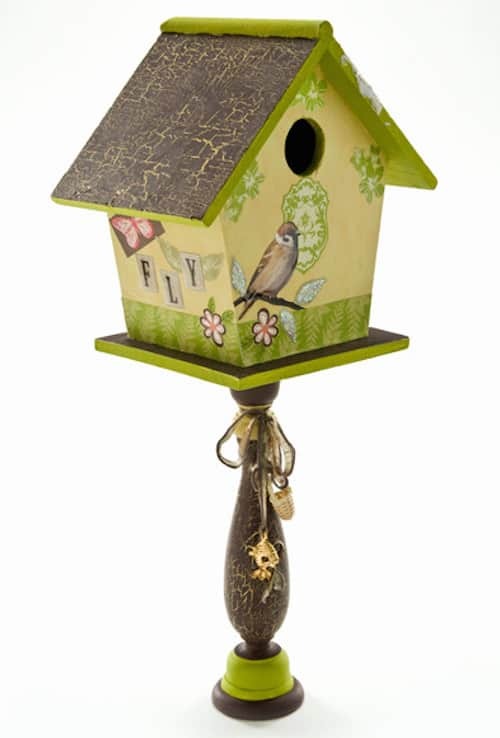 I've used their birdhouses and love the quality. Oriental Trading has DIY wood birdhouses here. I've not tried them, but they look cool – love that they can be painted and then assembled! They're perfect for classrooms or parties. 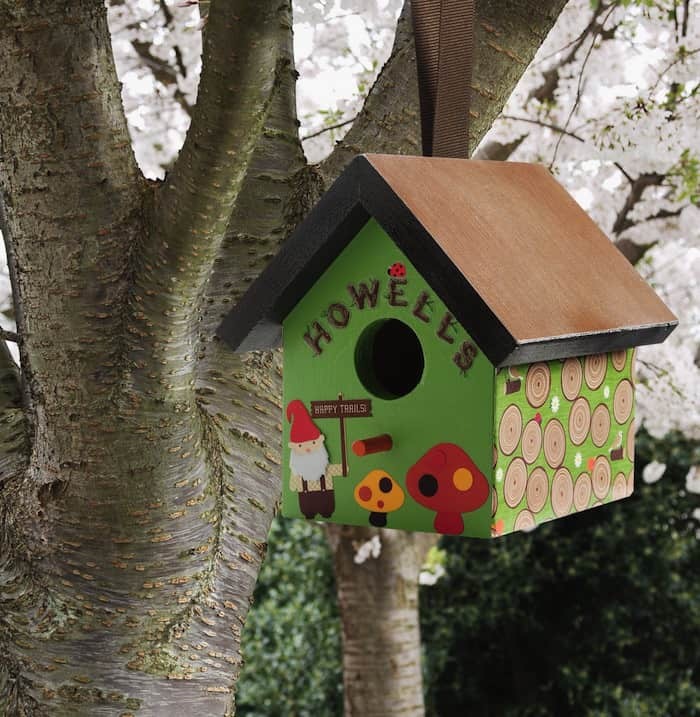 Birdhouses come in all shapes and sizes, as well as quality of wood. Sometimes your birdhouse will be completely smooth and other times it will need some sanding. I always have 80 or 100 grit sandpaper on hand just in case. Sand where needed and use a tack cloth to remove the excess dust. If you're working with a birdhouse that has been painted before, you'll want to make sure the surface is clean of free and dirt. If you're planning on re-painting with light colors, you'll want to prime first with something like acrylic paint or Kilz. 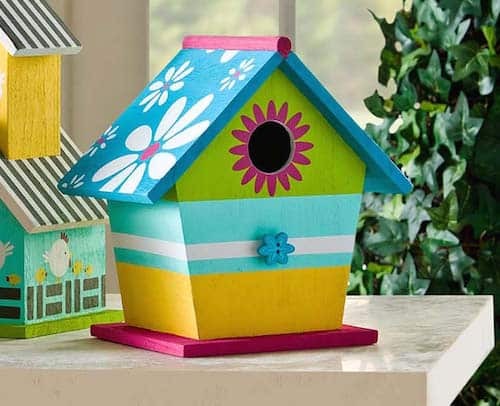 If you are planning on using the birdhouse indoors, you'll be fine using regular acrylic paint and don't need a sealer (other than Mod Podge). If you'd like to use the birdhouses outside, you'll want to use an Outdoor rated paint. 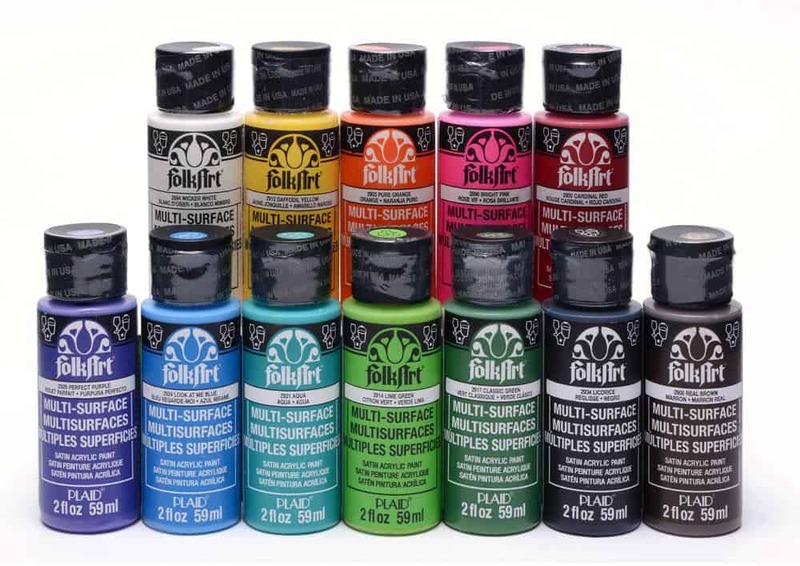 My choice for paints are FolkArt Outdoor or Multisurface. In addition, outdoor birdhouses should be sealed. 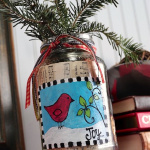 If you decoupage, you can use Outdoor Mod Podge. If you paint, I recommend an outdoor spray sealer. If you live in a very rainy area like I do, I recommend an oil-based polyurethane (several coats) over your paint. Same with decoupage. If you live in a wet area, seal with the poly, even over the top of the Outdoor Mod Podge. Tip: if you are repainting a birdhouse and using a primer to cover up the old color, use Kilz if it's going outside. This primer is highly mildew resistant and perfect especially if you live in a rainy area. Grab those old paint chips out of the drawer and decorate birdhouses with them! You're going to pick the palette of your birdhouse based on the colors of paint chips, which is pretty fun. 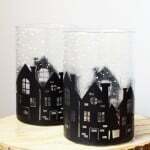 To create the pedestal, glue three candle cups together and use a small canvas as a base. The roof shingles were made using a 1″ circle punch. They were Mod Podged onto the roof from dark to light, and overlapped all the way up. Lace punches were used to make the accents around the base of the house, on the eve of the roof, and on the canvas. Decoupage the accents on using Mod Podge. Speckling adds a bit of interest to a “plain” canvas! 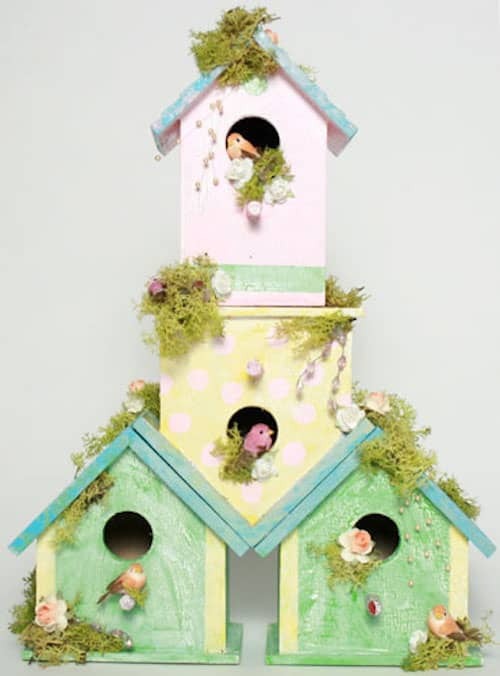 Choose three paint colors and paint one on the base of the birdhouse and candlestick, one on the roof and candlestick, and then trim with the third as shown. Dry brush that third color on the roof with a stencil brush. Decoupage butterflies to the front with Mod aPodge, then splatter paint with white and a paintbrush or toothbrush. Add distressing to the roof for an added accent. 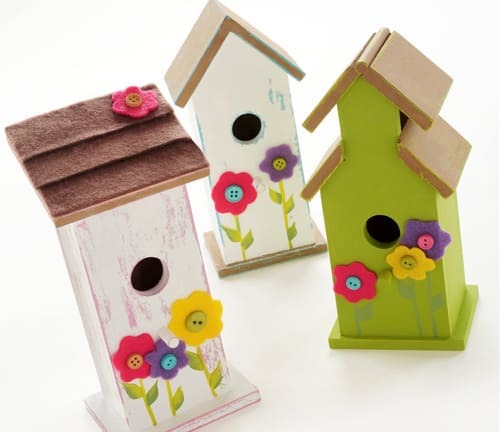 I love the pretty colors of felt used to decorate birdhouses in this project. Basecoat each birdhouse with the color of your choice; rub a wax candle over the top on the edges and then paint a second color. Use sandpaper to distress. Cut brown felt pieces to glue to the roofs, and also cut shapes for flowers on the front. Paint on stems and glue on buttons to finish. Stenciling is always a fun option if you feel like you don't have the skills to hand paint! Florals work well with decorating birdhouses . . . because who doesn't love flowers for spring and summer? In this project you're going to basecoat the birdhouse with solid colors first (including stripes with painter's tape). Then you'll add stencil accents in fun colors. 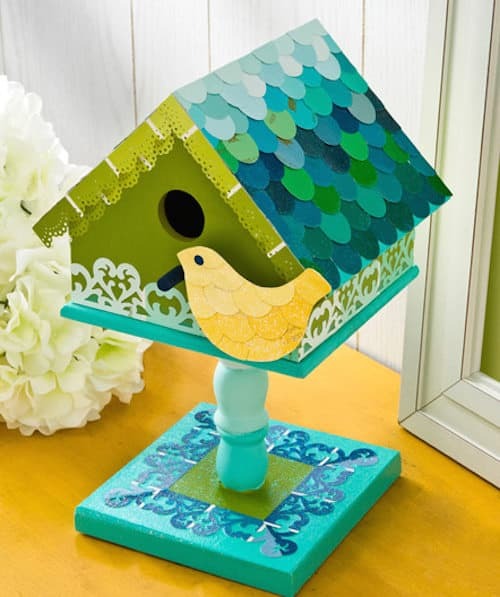 This is another way to stencil – but with this birdhouse, you'll be doing Mod Podge and glittering along with the stencil as opposed to paint. To use Mod Podge with a stencil, you'll want an adhesive stencil for clean lines. After you've added the Mod Podge to the project with the stencil, remove quickly and sprinkle the gold glitter. 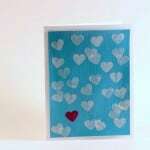 Allow to dry and the remove excess glitter. The excess leaves are the project were made using Mod Melts and Molds. For this particular project you're going to need to be able to use a drill – you're going to use a 3/8″ bit to drill seven holes in the roof – and those are going to hold the pencils. Besides that it's simple painting and stenciling to get the ladybug effect. 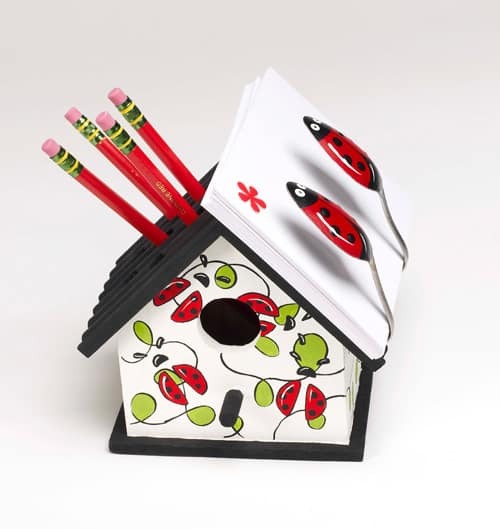 The most fun part of this birdhouse note holder is that you get to bend two spoons in the middle with needle nose pliers. Paint the ladybugs on back of spoons. Glue to roof as shown in photo using E-6000. You don't necessary have to completely cover birdhouses in paint! If you want to decorate birdhouses with some stripes and let the natural wood share the stage, I think that's a brilliant idea. Use painter's tape to create the stripes – don't you think the neon is fun? If you want any stands, paint candlesticks or candle cups; let dry and then glue to the birdhouses. With decorate one birdhouse when you can decorate four?? I love this birdhouse condo and the unique upside down idea. 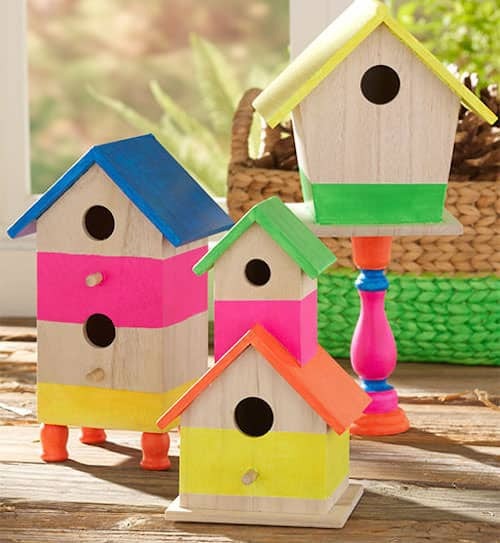 You can paint each birdhouse with a different color if you like. In this project, you can faux patina the roof by dipping a scrunched up paper towel into paint, then dab the paper towel onto the roofs of the houses to give them texture. Embellish the condo further by hot gluing moss, tiny birds, paper flowers and pearl sprays to the houses, roofs and openings. I'm absolutely obsessed with gnomes . . . and so I was able to decoupage a birdhouse with some of my favorite woodland themed papers, mushrooms, and gnome stickers. You'll want to paint the birdhouse first with your outdoor paints, and let dry. Then decoupage the papers down and seal them with Outdoor Mod Podge. Use an oil-based polyurethane on top if you live in an area with lots of weather. If rustic or vintage are your style, you might want to consider crackle. The one thing that I love about decorating birdhouses with crackle is how easy it is to do. There's a FolkArt Crackle Medium that you're going to love. Pick your two colors and then follow the instructions on the back of the bottle – it's that simple. 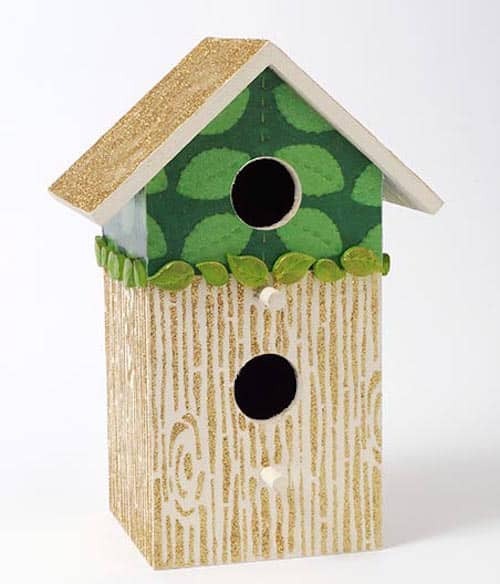 This birdhouse is a combination of paint, crackle medium, and decoupage of cut out papers on top. Glue the birdhouse to the candlestick to display. These are my favorite ways to decorate birdhouses – what are yours? I'd love to hear in the comments! I love birdhouses as blank canvases! I’m going to use some of your ideas on a box-full sitting on the craft table. They were in a commercial holiday garland, and rather than my friend throwing them out (can you imagine? ), I took them. They’re sturdy cardboard, so I think they’ll hold up to whatever method I try. I have terrible craft ADD. I like your phrase better. I can even go in with a list, and still get so distracted by everything else, I leave with nothing. Sometimes that works in my favor because I’ll see something in the craft store and realize I have something similar at home so I don’t need to buy anything. But more often than not, I don’t buy anything and think, “oh, I’ll just use—,” and talk myself out of what I really wanted to do in the first place. I have no idea why this happens only in craft stores. I don’t do it grocery shopping, at the hardware store or even with clothes. Anyway, I’m glad you spoke to it. Glad to know I’m not the only one! My oh my, do I ever get distracted!! Just the other day I went in looking for one, mind you, ONE item. Left with 6, hahaha! They will all be put to good use of course. If I would just stay in the lane I know I need to be in and not “window shop” I would be in better shape! Thanks for sharing so I know I’m not alone. Thanks for these great project ideas, gotta love Mod Podge, something for everyone and everything!! I can’t believe I am normal. I have always felt sort of sad and odd that I walk into a store full of art supplies and I all of a sudden can’t think of anything I want to get. I mean, I want it all. So I wander around and can’t concentrate on any one thing. At home, I have lists of supplies I really, really need, but when confronted by so many ideas and choices and fantastic stuff I freeze and can’t remember any thing. To make it worse, I only have a limited time to shop as I have health issues and can’t stay in any store too long. Also, my husband is with me and he doesn’t pressure me, (in fact, he insists I just buy everything I look at and doesn’t realize I am trying to picture in my mind what I need and what I would do with whatever it is I am looking at) and he keeps saying I thought you needed stuff why aren’t you getting anything? sigh. I know that should not be a problem, but it is. Anyway, thank you sooooo much for letting me know that this paralysis is common!